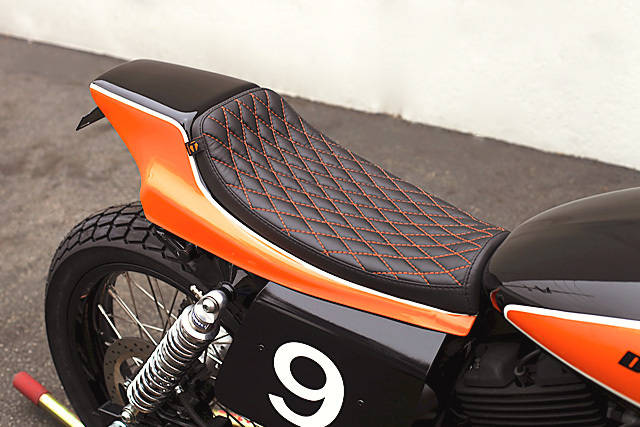 Long the hunting ground of the older, more experienced rider, Harley are now making it easier for younger riders to get onto the brand’s legendary iron. The company (through their local dealers) have set up bike schools to help. 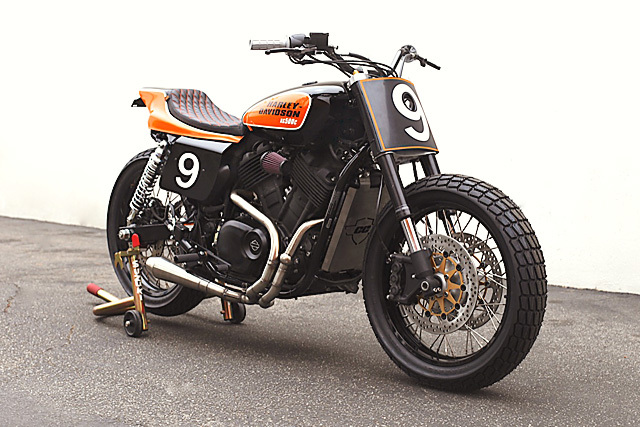 New riders who feel they have a real lack of leather tassels in their lives can go to the Harley Riders Course and learn how to do the do on a brand new Street 500. Luckily for us, they can also trash them. 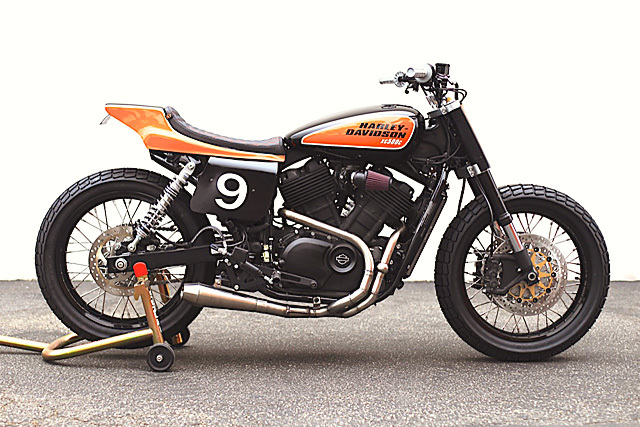 “While dropping off a finished bike,” says Chris, “the owner at Bartels’ Harley Davidson asked if I could build him a dirt track bike from a pile of junk. So we walked over to the back of the dealership and there on a pallet was a brand new 500 with the front forks and front wheel sitting on the seat. It was quite a sight. The entire front end had been broken in half after a collision with a dumpster at the riding academy.” The lady riding it at the time also broke her pelvis; clearly she found out the hard why you don’t pin the throttle and the brake at the same time. This particular bike was the first Chris had allowed had allowed himself to really have fun with and spend some time on. 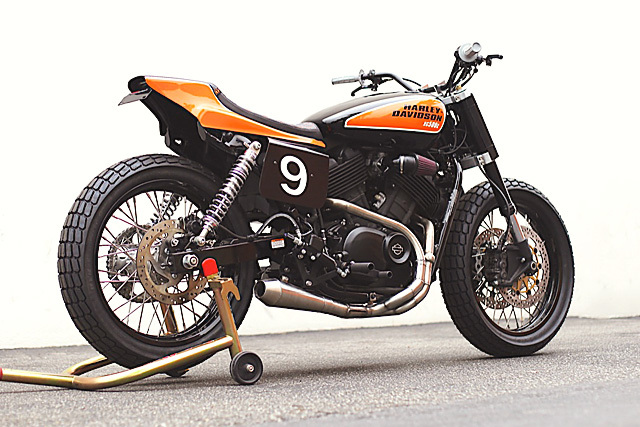 “I had plenty of freedom building this bike, however Bartel’s was specific about a few things, including the exhaust, paint colors and the inclusion of street-legal brakes.” So instead of a full-on dirt track bike, Chris ended up building a combo dirt and street tracker. The rear of the frame was cut to the length of the new seat, capped and then welded. 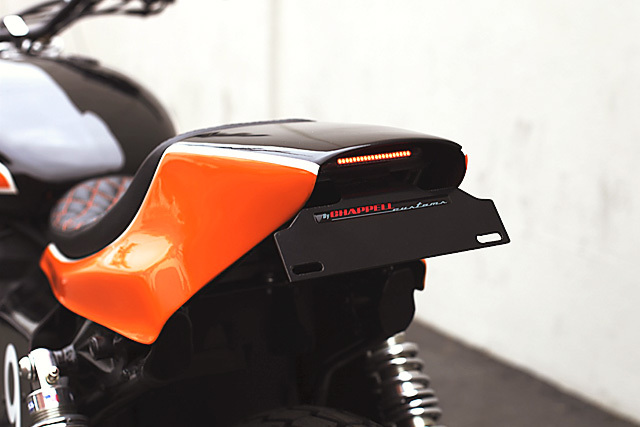 Then the new seat supports were bent and welded on; this also doubles as the bike’s license plate holder and a LED taillight mounting area. Deciding they wanted a chain drive and dual disc set-up, they called their wheel guys and got a brand new 19″ custom rear hub. For the front hub they contacted Cognito Moto. “They already have a hub for R1 spoke conversions, so we figured it would be faster than making a front hub. Unfortunately it posed many unforeseen issues, including a swing arm that wasn’t quite long enough,” Chris laments. 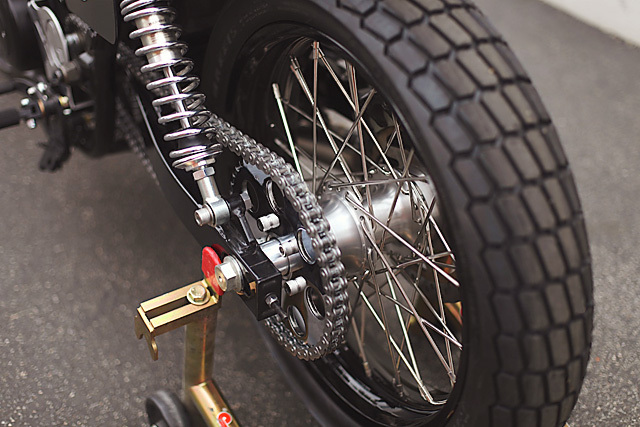 A solution was found in the form of a Ducati front sprocket and by milling an extra inch into the rear axle holes for a touch more rearward chain adjustment. The bike’s triples and wheels took about a month to complete, so Chris used the time to get the paintwork finished with his own custom graphics. 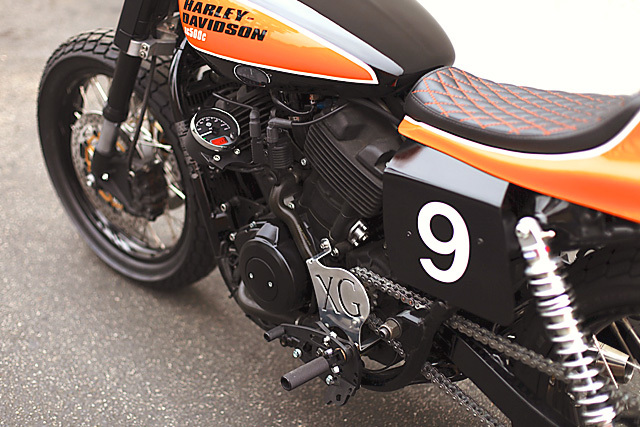 “The ‘c’ in ‘XG500c’ is for Chappell Customs,” he chuckles. “Then I had some time to make a custom intake with some scrap bends of metal. I cut the flange on the CNC plasma machine and added a K&N cone filter to the end of it. Then I designed a new front sprocket cover to keep your toes out of the chain.” Sounds useful. Chainsikle was also asked to modify Chappell’s existing XG rear set design to get them lower and more in the middle of the bike, so they designed a brand new set just for this bike. Chris knew he was making the bike’s new exhaust, so he wasn’t overly concerned with stock exhaust clearance for the new pegs. 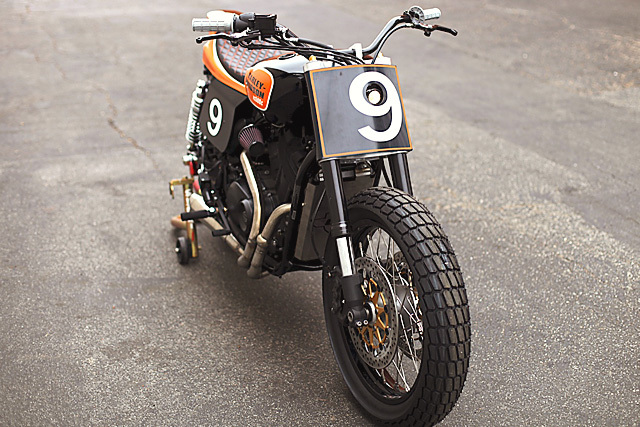 The front of the bike got a handmade number plate with a single projector-style headlight, a new master cylinder, fresh lever assemblies and some dirt track bars. The ABS side covers were also made at the same time. 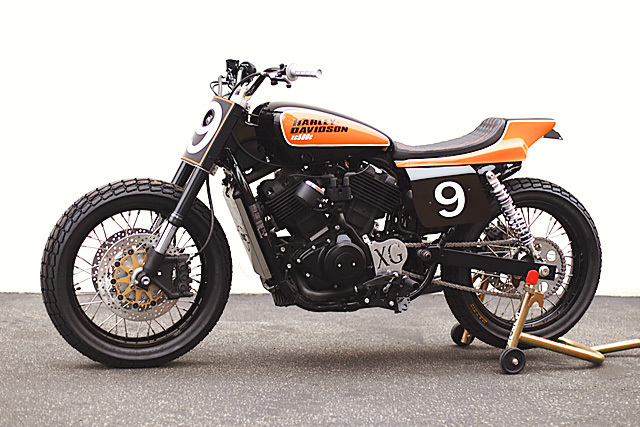 “These were simply attached to the stock side covers to give them more of a dirt track look. 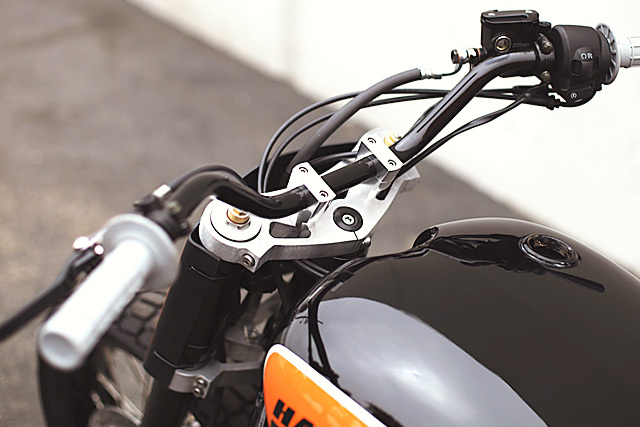 I also designed a side mount speedometer bracket, as we needed to keep it street legal.” The bike also got a small LED brake light and a license plate holder. Finally, a set of Works Performance shocks were fitted at the rear to get the bike up where it needed to be. And we’ll be nice and give Chris the last word so he can maybe make a buck or two to feed himself. “Many of the parts I made for this XG’s are available in my store at Tuffside.com. 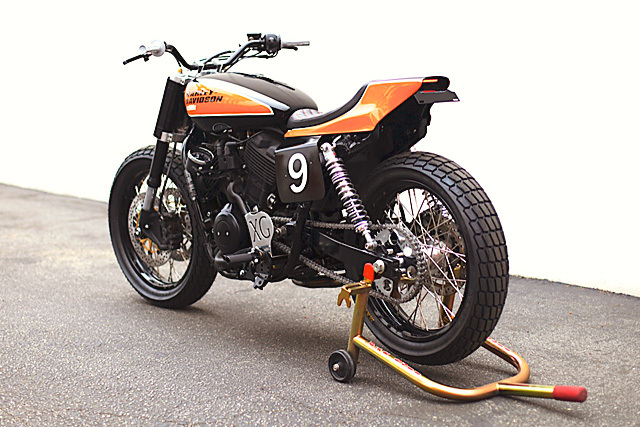 I plan on making more parts available for it, as it seems to be a very popular bike for many first time bike buyers who also want to add a few of their own touches to it.” We’re all for touches – just as long as it doesn’t involve contact between bikes and dumpsters. Poor dumpster.